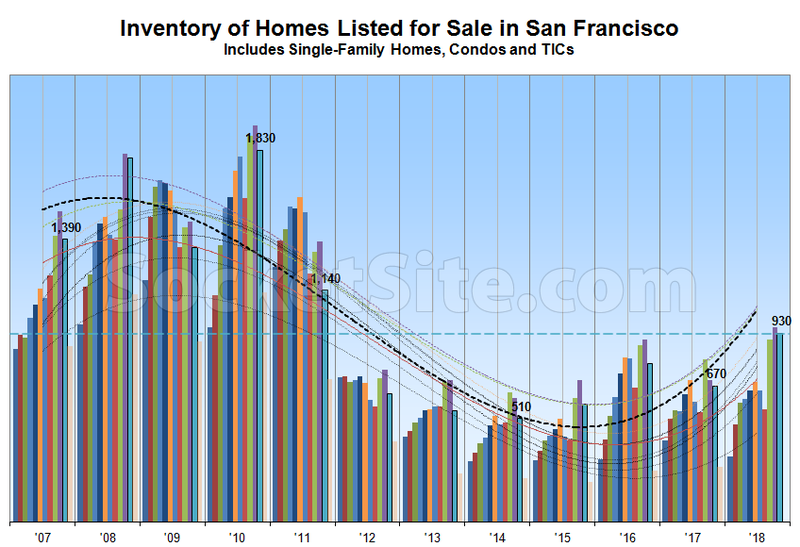 Having hit a 7-year high in the absolute last month, the number of listed homes on the market in the San Francisco has ticked down 3 percent over the past two weeks to 930 but remains 39 percent higher versus the same time last year, 82 percent above its mid-November mark back in 2014, and at a 7-year seasonal high. At a more granular level, the number of single-family homes currently listed for sale in the city (320) is running 45 percent higher on a year-over-year basis while the number of listed condominiums (610) is up 36 percent, not including the vast majority of new construction condos still for sale across the city. 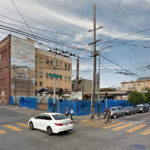 At the same time, having hit a two-year high last month, the number of homes currently on the market listed for under a million dollars (230) is still running 42 percent higher on a year-over-year basis while 25 percent of the homes listed for sale in San Francisco have undergone at least one price reduction, which is even with the same time last year. Expect inventory levels to decline though the end of December with normal seasonality in play and the percentage of listings with a price cut, which topped out at 27 percent in San Francisco last year, to tick up. And once again, while inventory levels are up, the number of homes in contract across San Francisco is currently running 11 percent lower versus the same time last year. Inventory is up and many stories at SS highlight loses or flat results for recent sales. Even though the median price figure is not a perfect gauge, we should start to see that fall consistently (the YOY number) in the coming months. “Fall” is relative – more precisely, the YOY gain should start to consistently drop. Condo numbers should lead that decline. Condo prices peaked in late 2015 then fell, recovered some but have not come back to their 2015 peak. This statement has been true since 2014. Factually speaking, we actually featured more stories like this circa 2014 while noting the early makings of the slowdown which has now firmly taken hold (no, it didn’t “just happen”). 152 22nd Avenue, listed for 1.895mm. Supposedly will close for 2.1+. Sad pink stucco on the outside. 122 22nd gunning for the same price context (listed for $1.888,888 mainland-style, want to trade over) I would have expected both of these to trade closer to list. 6529 California is a pretty little 2Ksf flip house all fixed up, asking $1.995mm and Redfin says it’s HOT! Maybe so, but a busy street and next to a wreck. My gut says it will trade more like $1.8mm. They paid 1.2mm and re-did foundation and everything, so it seems like the margin on it will be, like the listing agent, rather small and skinny. 6529 Cali had its list priced *increased* $180K today to $2.175mm. I hope they get it! I own property nearby and would love to see it print at that price. 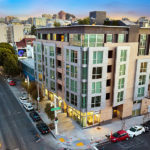 It’s walking distance to the emerging higher-concept restaurant section nearby in the low 20’s avenues: Pizzetta 211 & Pearl on California, Fiorella, and Violets on Clement. These places are packed whenever they are open. Running on the bluffs above Baker, reasonable street parking. Great schools. Close to surfing. But those interest rates climbing! I wish them luck. Whoa. 1158 square feet to 1920 square feet, to the studs and new foundation remodel. That’s quite the little flip. The list price for 6529 California has now been reduced to $2.15 million and Redfin’s “Hot!” moniker has been disappeared. 6529 California off-market. If I am not mistaken the flippers have recently volunteered to paint the front of the adjacent neighboring homes to try to liven up the curb appeal. Great for the ‘hood! Keep trying! 6529 California has just been listed anew with an official “1” day on the market according to all industry stats and aggregate reports. The sale of 6529 California has closed escrow with a $2.15 million contract price (and only “46 days on the market” according to all industry stats and aggregate reports). Thanks for pointing this out. I am still surprised they were able to get $2.15mm for this little place. It’s in a row of four like houses – the beat-down little sisters of the painted ladies. The 46 days on the market may not be accurate, but I would say this sale demonstrates the strength of the market more than anything else. Good for them. It was well-painted, floors refinished, and staged, very good location, but plenty of work to do inside and out if the owner wants a ‘new’ feel. Old kitchens and baths. $978 per square foot. Spend another $400psf easy easy to get it up to highest value. That was a head scratcher for me. Bought it for 2.1, did about a month’s work on it repainting and refinishing floors, repainted the cabinets, maybe some new appliances and other cosmetic stuff. Total cost $50K, if that. But they held it for a year, holding costs of $100,000. Then they spend $100,000 on staging and selling costs. So they are into it for $250,000 and they sell for $100K “gain”. So they lose $150K on the deal. Had they intended to do more but the market wouldn’t let them? Did they just live in a wreck while they repainted it themselves on the weekends and then unloaded it when they realized it was going to need a lot more work than they could do themselves? The whole thing made little sense to me.